NEW YORK (CNNMoney) -- Shares of Apple reached $500 for the first time on Monday, setting yet another high-water mark for the tech giant. Apple's (AAPL, Fortune 500) stock has been soaring lately, boosted by record sales of the iPhone and iPad. Even the 28-year old Macintosh line continues to set new sales records. Shares closed at a record $502.60, up 2% from Friday's close. But this rise isn't a recent development. Apple shares have been rising at a consistent trajectory for the past three years. It was just six months ago that Apple cracked the $400 level for the first time, and it's been 16 months since it passed $300. Shares traded above $200 for the first time in October 2009. At this time three years ago, shares traded at just $78.20. Despite Apple's stunning rise in share price, the company's stock gains haven't even kept pace with its earnings. 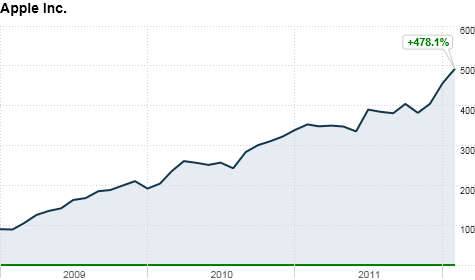 The stock has grown 40% over the past year, but Apple's profit has grown 117% since the fiscal first quarter of 2011. Over the past two years, Apple's stock has grown 150% and profits have soared 286%. The stock has risen 539% in the past three years, but profits have grown 711% over the same time period. That means Apple's shares are relatively cheap. The tech giant's stock trades at just 12 times its expected earnings for 2012, which makes it cheaper than the tech-heavy Nasdaq 100, which trades at about 18 times forecast earnings. And Apple is wildly cheaper than some of the other tech companies out there with far less predictable futures, like Netflix (NFLX), Zynga (ZNGA), LinkedIn (LNKD) and Facebook. Apple had $127.8 billion in sales during the 2011 calendar year, putting it neck-and-neck with Hewlett-Packard (HPQ, Fortune 500), the nation's largest tech company by revenue. Yet Apple continues to grow like it's a startup. This year, Apple is on pace to become the biggest technology company in the world, measured by revenue, outpacing current global No. 1 Samsung. Last quarter, Apple posted $13 billion in sales. It was one of the most profitable quarters ever for any U.S. company, trailing only ExxonMobil's (XOM, Fortune 500) record-setting $14.8 billion quarter from the fall of 2008, when oil prices were at an all-time high. Apple recently surpassed Exxon's market capitalization to become the most valuable company on any American stock market. Apple's market cap is nearing $500 billion, which would put it in elite territory. That's a threshold only reached by Microsoft (MSFT, Fortune 500), Cisco (CSCO, Fortune 500), General Electric (GE, Fortune 500) and Exxon for brief moments over the past decade and a half.